jumblebox101 has no other items for sale. Details about BROTHER DCP-7055 A4 MONO MULTIFUNCTION LASER PRINTER "BRAND NEW CLEARANCE"
BROTHER DCP-7055 A4 MONO MULTIFUNCTION LASER PRINTER "BRAND NEW CLEARANCE"
Brother DCP-7055 Mono Laser 3-in- 1 printer. Features print, copy and scan functions with 20ppm print and copy speed, first page out in 10 seconds, colour scan to PDF and 250 sheet paper capacity. I like this item, fast print speed, and it is very clear, but I feel a little noise of it, it is still a good product. Great printer, real value for money. This printer is fast, quiet and really quick. This printer is far better than the last four printers I have owned, I had forgotten how fast and quiet laser printers where over ink jet printers. The scanner on this printer is also easier to use than the scanner on my ink jet all-in-one. Great machine. Small in size but powerful and professional. The ink cartridge can print many many pages effortlessly. Photocopy and scan are the plus. 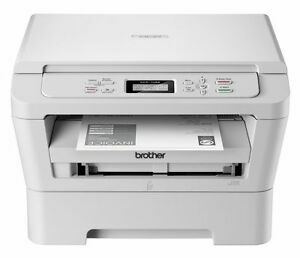 I've not bought many laser printers in my life, so I'm in no position to compare the Brother DCP-7055 to other printers in the same class. That said, this machine is superb and redefines the notion of value for money. Bargain of the century in fact. Let's hope the planned obsolescence department had no role in its development. Easy to use. Economic. Great value for money. The extra programmes are very good. I like this product.